These terms and conditions will apply to all sales of products made between AGA Cookshop and our customers. We make every effort to ensure that all our prices are correctly published, however, should any price prove to be wrong, any offer to purchase our products at the misquoted price will be rejected by us. In the event that an order is placed for a misquoted product we will contact you to inform you of this. You will then have the option to accept the correct price or decline, at which point you will be given a full refund for any payments made for those particular goods. For all orders to the Channel Islands there will be a charge of £9.95. This offer is for goods only and excludes electronic E-Vouchers. If your order ONLY contains electronic E-Vouchers you will not be charged shipping costs if the delivery address is in the UK and Northern Ireland. 1.1 The following Terms and Conditions apply to all transactions and all orders are made subject to your acceptance of them. Please read them carefully before placing your order as your order will be accepted strictly on the understanding that you accept these conditions of sale. 1.2 You have certain statutory rights as a consumer which are not affected by these terms. Contact your local trading standards office for more information. Words in italic type are legal words which clarify, rather than alter, the meaning of the relevant clause. 2.1 We may change anything on our website at any time, at our discretion. 2.2 We have no responsibility for the content of any websites other than our own, even if our site links to other websites. 2.3 We retain all rights to our website design and all images on it. We have copyright and other rights to the design, look, style, appearance and content of it. You may view and print the website only as a buyer or potential buyer from us. You may not modify, publish, reproduce, distribute or broadcast in any format any material found within this site. 2.4 We may restrict or suspend use of the website (typically for repairs, introduction of services or general maintenance). Where possible we will post warnings on the site first. We will try to do this no more than we have to, and keep the time of disruption as short as possible. 3.1 You may open an account with us. You will need to log on to our website with your own account login name and password, in order to use your account. You warrant to us that the personal information which you are required to provide to us when you register as a customer is true, accurate, current and complete in all aspects. You must keep your account name and password confidential. You must keep that information safe to prevent unauthorised users from having access to your account. 3.2 You must tell us immediately if you believe that your account is being used without your authority, or if you believe the security of your account information is compromised. 3.3 You are responsible for all activity on your account, including, as examples only, purchases, returns and cancellations. 3.4 Please check that all information you give us for your account is accurate and complete. Please tell us promptly if any of that changes. 3.5 We may, at any time, and without having to give any reason, suspend, modify or close accounts. 4.1 You place an order with us for goods on the website when you press the order confirmation button on the checkout screen. There is no commitment on us to supply those goods, at that price, or at all, until we decide to accept your order. 4.2 Goods are subject to availability. We will tell you if we cannot meet your order (or part of it) from stock or within a reasonable time. 4.3 When your goods are despatched from our warehouse we will send you a despatch confirmation email. Order acceptance and completion of the contract between you and us will take place on the despatch to you of the goods ordered unless we have notified you that we do not accept your order, or unless you have cancelled it in accordance with section 8 (below). 4.4 Reasons for non-acceptance of your order include the following. The goods you ordered being unavailable from stock, our inability to obtain authorisation for your payment, our identification of a pricing or product description error. 4.5 We may pass your details to third parties for address, identity, credit checks and payment processing in order to protect you and us from fraud. 5.1 The price and delivery charges will be shown at ‘checkout’. We make every effort to ensure that all our prices are correctly published, however, should any price prove to be wrong, any offer to purchase our products at the misquoted price will be rejected by us. In the event that an order is placed for a misquoted price we will contact you to inform you of this. You will then have the option to accept the correct price or decline, at which point you will be given a full refund for any payments made for those particular goods. 5.2 We quote the price inclusive of VAT. We will charge you the price inclusive of VAT, at the rate applying at the time of delivery. VAT is currently (March 2011) 20% for all goods we sell with the exception of Books. 5.3 The price quoted for the goods excludes delivery (unless otherwise stated). 5.4 You must pay for the goods (and delivery) when you place your order. 5.5 You must pay by MasterCard, Visa, Visa Delta, Amex or Maestro cards or PayPal. We regret we are unable to accept other means of payment. 6.1 We aim to deliver within reasonable time, however, all quoted delivery dates and times are targets only and we cannot guarantee delivery at any particular time or date. 6.3.2 the cancellation will be on the basis that you have no further claim against us under that contract. 6.4 If you accept delivery of substitute goods, or goods to be delivered at a later date, it will be on the basis that you have no claim against us for delay (including loss of profits, or other financial loss, of indirect or consequential loss, or increase in the price of the goods). 6.5 We may deliver the goods in instalments. Each instalment is treated as a separate contract. 7.1 Risk and Title of the goods will pass to you once they are delivered to you or a person requested by you to receive the goods on your behalf. 7.2 You must inspect the goods on delivery. If any goods are damaged (or not delivered), please let us know as soon as possible by emailing us at acookshop@aga-web.co.uk. We reserve the right to ask you to send us reasonable evidence of any damaged goods. 8.1 If you wish to amend an order then please contact our online enquiries team on 0800 8046296 and 0345 3452823 or at acookshop@aga-web.co.uk. 8.2 You will have a right to cancel this contract without providing any reasons, within twenty-eight days of delivery, beginning on the day after the date on which we deliver the goods to you (“Cancellation Period”). 8.3 Please note that your right to cancel does not apply to perishable goods. 8.4 If you wish to cancel this contract during the Cancellation Period then please contact us to let us know. Examples of ways you can do this include by email to acookshop@aga-web.co.uk or by telephoning 0800 8046296 and 0345 3452823. It is also possible for you to send the below cancellation form to us at AGA Cookshop, Station Road, Ketley, Telford, TF1 5AQ or by email to acookshop@agarangemaster.co.uk. It is sufficient for you to have sent your cancellation notice within the Cancellation Period. 8.5 Please note that you will be responsible for returning your goods to us, and you will be responsible for any costs incurred in doing this. If the goods cannot be returned by post, please contact Customer Services on 0800 8046296 and 0345 3452823 and we will assist you with returning your goods and will provide an indication of the costs for this. 8.6 Once you have provided us with notice that you will be cancelling your contract you must return the goods to us within 14 days to the following address: AGA Cookshop, Station Road, Ketley, Telford, TF1 5AQ. 8.7 If you choose to cancel your contract with us during the Cancellation Period you are entitled to a full refund of the cost of your goods. Furthermore, if you wish to return all of the goods that you ordered as part of the contract, you will be entitled to a refund for all standard delivery charges paid to us. 8.8 This refund will be paid to your account within 14 days following the day after which we receive the goods back from you, or receive proof that you have posted the goods back to us. We will provide the refund using the same method that you used to pay for the goods and we will not charge you for the refund. 8.9 We ask that you return your goods in their original packaging and in a saleable condition. We reserve the right to deduct an amount from your refund to reflect any diminished value in the goods which has been caused by unnecessary handling by you, up to the value of the goods. 8.10 We are under a duty to provide goods in conformance with this contract. Nothing in this clause shall affect your legal rights as a consumer. For more information in relation to these legal rights please contact your local Citizen’s Advice Bureau or your local Trading Standards Office. 8.12 In the unlikely event that you are unhappy with your goods or our service, and you wish to make a complaint, please forward your complaint in writing to us at acookshop@agarangemaster.co.uk, and a member of our customer service team will contact you. 9.1 We warrant that, on delivery, all goods shall comply and conform in all material respects with their descriptions on our website and any information, specifications and guidance which is set out on our website. 9.2 Subject to clause 9.3, if either of us fails to comply with these Terms, neither of us shall be responsible for any losses that the other suffers as a result, except for those losses which are an obvious result of the failure to comply with these Terms, or which both you and us knew might occur as a result of a failure to comply at the time at which you purchased the Goods. 9.3.1 Business losses, which includes loss of business, business interruption, loss of profits or loss of revenue or income. 9.3.5 any waste of time. However, this Clause 9.3 shall not prevent claims for foreseeable loss of, or damage to, your physical property. 9.4.5 any other matter for which it would be illegal or unlawful for either you or us to exclude or attempt to exclude our own liability. You may obtain information about your legal rights by contacting your local Citizen's Advice Bureau. 10.1.3 Expressly stating an intention to vary these terms. 10.2 All orders that you place with us will be on these terms (or any that we may issue to replace them). By placing an order with us, you are expressly waiving any printed terms you may have to the extent that they are inconsistent with our terms. 11.2 If you are more than one person, each of you is liable for all of your obligations under these terms (joint and several liability). 11.3.2 if it would be enforceable if amended, it will be treated as so amended. 11.4 No contract will create any right enforceable (by virtue of the Contracts (Rights of Third Parties) Act 1999) by any person not identified as the buyer or seller. 11.5.2 which expressly states that you may rely on them when entering into the contract. 11.7 Please note that we may transfer personal information about you to those we may appoint to administer your account or recover amounts owing. That may include, for example, passing information about you to our insurers, debt recovery agents and solicitors, if you fail to pay us. 11.8 It is our intention to comply at all times with all relevant UK laws including Health and Safety at Work and Environmental Protection Acts. Under the Offensive Weapons Act 1996, it is an offence to sell knives to anyone under the age of 18 years. No order shall be accepted for the supply of any knife to a person under the age of 18 years. 11.9.1 All orders are placed with AGA Cookshop, which is a trading name of AGA Rangemaster Ltd, Registered Office: Meadow Lane, Long Eaton, Nottingham. NG10 2GD registered in England number No 3872754, Vat registration No. GB 100 5835 13. The contents of this site are intended for your personal use only and may not be displayed or reproduced without our written permission. The contents of this site may be down loaded or copied for personal use. 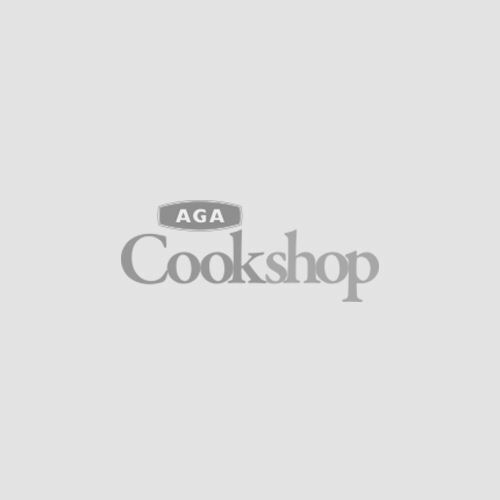 While every effort is made to ensure the accuracy of the information on this site, AGA Cookshop disclaims all warranties concerning accuracy. AGA Cookshop will not be liable for any damages of any kind related to the use of this site. AGA Cookshop reserves the right to amend, add, omit or alter any aspect of this site at our discretion and without prior notice. Station Road, Ketley, Telford. TF1 5AQ.